Rachel, Wellbeing Practitioner from the Counselling, Health & Wellbeing Service, shares tips on coping with anxiety before and during exams. It is natural to feel anxious prior to an exam. In fact, a little anxiety can actually help performance. Anxiety and stress cause the body to release adrenalin which can be helpful when responding to challenging situations. Whilst being laid back has its advantages, being so laid back that you are horizontal can mean you may lack the motivation needed to do well! Equally, too much adrenalin can lead you to feel distressed and hinder performance. You need to be able to strike a balance between too little and too much anxiety. The purpose of this blog is to help you manage your anxiety and achieve an optimal level to promote alertness and performance. 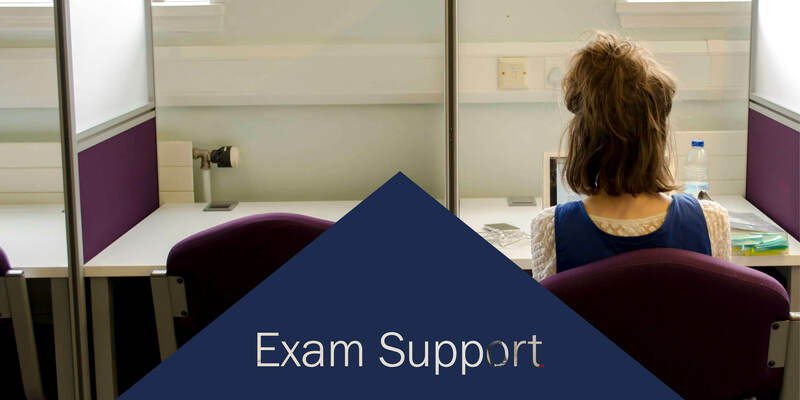 Set out plenty of revision time well in advance of your exams – around six weeks is usually enough, but leave yourself more time if you feel like you might need it. It’s better to be safe than sorry! Make sure you’re revising effectively. Focus on essential materials and be active rather than sitting and reading for hours at a time. Don’t be afraid to ask your tutor or lecturer for help if you get stuck during your revision. Don’t focus your whole life on revision. Make sure to take regular breaks, have days off and get enough sleep. Eat well – your brain needs energy and fuel to make the most of your revision time. Talk to your friends and family about your worries. Don’t bottle things up! 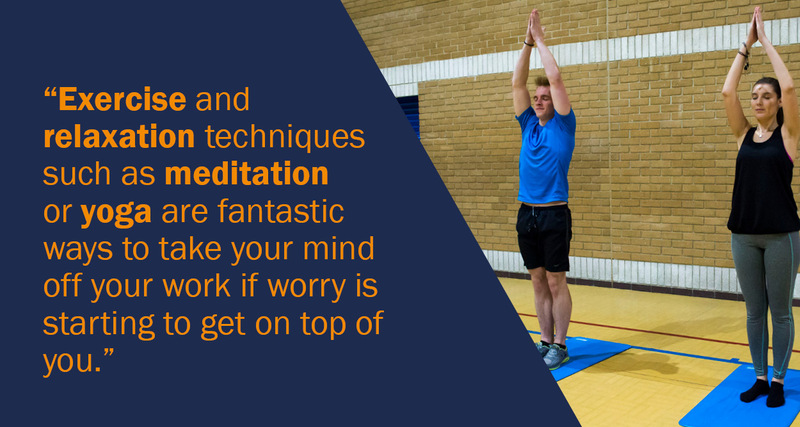 Exercise and relaxation techniques (such as meditation or yoga) are fantastic ways to take your mind off your work if worry is starting to have an effect on you. Learn a relaxation technique in advance so that you can utilise it if you need to. Try to avoid working too close to the exam – don’t stay up late the night before or get up early on the morning of. A good night’s sleep is more valuable than an extra few hours of revision. Watch a funny movie or read a funny book – humour is a great way to take your mind off of your worries. Make sure you’re thoroughly prepared for the exam to minimise your worries. Check that you’ve got the right time and location, pack your pencil case with everything you might need and lay out your clothes for the next day. Remember to eat – your brain will need the fuel in the exam! Dry bread, crackers and cereal all help settle a churning stomach. Close your eyes and take a few deep breaths. Repeat this whenever you begin to feel anxious. Read through the instructions and questions slowly and carefully, highlighting key points. Plan your answers. This is important as it helps your writing flow and means you don’t end up panicking and going off on tangents. Answer the easiest question first if you feel like this will relax you. If you start to feel unwell, have a drink and close your eyes for a few seconds. Shake your arms and move your head from side to side to release the tension. If you need to, let an invigilator know how you’re feeling and ask to step outside for a minute. Fresh air may be just what you need to calm down. 5:7 breathing – Breathing deeply into the diaphragm reduces blood pressure and heart rate and therefore also reduces our level of emotional arousal. To learn diaphragm breathing, try the following: Lie down and breathe in through your nose for 5 seconds… pause for one to three seconds… then breathe out through your mouth for 7 seconds… pause again and repeat the process. Progressive muscle relaxation is very helpful for relieving the tension held in your muscles and helps both your body and mind to relax. Practice muscle relaxation during deep breathing. Focus on a particular muscle group (e.g., shoulders) and alternatively tense and relax the muscle. Focus on releasing all of the tension in the muscle, repeating ‘relax’ in your mind. *Please note that this blog only outlines a small number of strategies for managing exam stress. Mindfulness can be a way to live life more in the present, thinking less about the past and worrying less about the future, and can help relieve exam stress. Bookable appointments are available via our online referral questionnaire. Watch our video to meet our friendly and approachable staff, who will listen to you non-judgmentally, in a safe and confidential space.